Marriage is the secure institution for the perpetuation of the species and also for maintaining the property granting rights. In India, arranged marriages are the centuries old tradition dating back to the fourth century. The culture of arranged marriage is considered as a foundation stone of the Indian marriage system. In ancient times, the marriages often took place at the time when bride and groom were in their adolescence age. The boy's parents searched for a suitable girl with the help of middlemen and approached the girl's parents with proposition. The middlemen or negotiator suggested suitable date and hour of marriage according to the birth charts of the couple. In that era, generally marriages took place at the hometown of the girl and bride's family acts as a host for the groom's family. Certain references to the polygamy and polyandry are visible in Hindu marriages because of various political as well as social reasons. At that time, falling in love before marriage was more than a crime; still, we can find the traces of affectionate relationships between princes and princesses. The tradition of Swayamvars arranged by the kings for their daughters came into existence in the middle ages. During that era, swayamvars were considered a modern way of choosing grooms on the basis of their abilities and also provided brides a chance to make their own choice. The right of selecting bride and groom for both men and women has gone through a period of transition due to social changes, wars, diversity in cultures etc. Later on marriages turned into materialistic deals with the emergence of dowry system. The dignity of women was lost and she became just another commodity to be exchanged in lieu of social and moral burden on her family. References to the marriages in ancient texts clearly suggest that the Aryans were monogamous. You can also find traces of polygamy and polyandry in the Mahabharata, the Hindu epic. Marriage was compulsory for all girls in medieval India; however, the girls opted for asceticism is exception. Polygamy was popular among the Kshatriyas. Child marriage was not prevalent in ancient India, but became a common phenomenon in the medieval age because of political anarchy at that time. The prevailing modernization and globalization has changed the status of women in the society, which has brought the revolution against the mal practices with women in the name of marriage. It was a common belief that the women has to stay with grooms family after marriage, although, some couples prefer to live alone. Groom was supposed to look after the needs of the bride for the rest of the life. The selection of the couple was generally based on Shastric ideas, according to which, the bride's parents not only searched for good deeds in the boy but also considered his family, education, social behavior, etc. 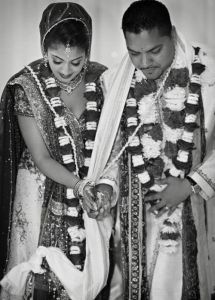 The custom of Indian marriage has gone through tremendous change, but the essence of this tradition is still the same. This sacred institution is made for binding the two souls together for the life time.